At Cafe Kiev, courses are the most important part. Bring a bunch of friends, move the tables together, and order as much as possible. I was lucky enough to be dining with one Ukrainian for this meal and a few other friends, so we let him do the ordering and settled in for a good night. Three hours later we were practically needing to roll ourselves down Kings Highway when we left. The small dining room just off the main road is trying hard to be trendy and sleek, but fails just enough (in a very awkwardly good way) to make you feel comfortable for your home-cooking. The odd color scheme, glass chandeliers, maps of Kiev and Ukraine, and various random art, as well as tables of Russian and Ukrainian-speaking groups make this a legitimate excursion spot even before you look at the menu. The order seemed a tad strange, but I present the meal as it was presented to us. Solenya ($3.95) and bugenina ($5.95). The solenya is a grouping of cabbage and onions and pickles, really just a way to get your mouth warmed up. The bugenina was listed on the specials board, so I was a bit surprised to see it come out on the first round. It is a cold dish though, and is served with some very special "Russian wasabe," a beet and horseradish mixture that really added a nice pop to the slices of pork. As we were finishing up the first dishes, two more arrived in the form of the fresh cabbage and cucumber salad ($3.50) and the salad olivie ($3.95). The former looked amazing but had a bit less taste than expected. Never fear, a dash of salt and pepper and a squeeze of the lemon was zest enough. I think it could have stood a more liberal sprinkling of dill as well. The olivie was a very familiar taste, like a potato salad and egg salad in one. It was thoroughly laced with mayonaise, but not overwhelmingly rich somehow. The Ukrainian amongst us commented that it was like eating another family's olivie, simply saying it was not like mom's. We all sort of tasted it and probably were a little afraid to admit our pleasure seeing as how "low class" we might have felt, but the dish disappeared quite rapidly nonetheless. The third round was devoted to soups, and we sampled three. The first to arrive was the kharcho ($3.95, below), which I overheard described simply with "It needs more crap in it." Dark red broths usually lead to amazing results, so I think all of our expectations were built up very high. The soup is good, but definitely the weakest of the three given how good it can be. A definite winner was the frikadelki ($3.95, below), a chicken meatball soup with an excellent thin broth. The firm meatballs were good for cutting up and sharing, eating alone, or with the broth. If it were my bowl, I would have even gone so far as to place a big dollop of sour cream inside of it. Luckily, I was able to do just this with the third soup we sampled, borshch ($3.50, below). This was my hands-down favorite of the round, and had me smiling from its not too beet-y but just beet-y enough deliciousness. This general good mood lasted for a nice digestive intermission before the next foods started arriving. Things started getting real serious the moment our two plates of vareniki ($5.95 w/meat, $5.50 w/potatoes and mushrooms, below) arrived. These little guys were the real deal, nothing like you will find frozen and thawed in hipster Eastern European restaurants in Cobble Hill. Although the cabbage was a bit soggy (an unfortunate consequence of not making them right when ordered), the golubtsy ($5.95, below) were otherwise spot on, bursting with flavor unlike any other restaurant-bought version. These stuffed cabbage rolls were very good. Our final entree was the meat cutlets ($6.95, below), two beef-veal-chicken patties served with buckwheat. This is not actually an accompaniment option, but we had an insider who asked for it instead of the available home fries, mashed potatoes, or rice. This made for a far more interesting dish. With no room in our stomachs left, the table made the bold decision to order more. Out came an odd rendition of baklava and a nice pancake dish served with strawberries and bananas (below). The edges of the pancakes were nicely crispy, something I had never seen before. Even if you do not order dessert, go ahead with a pot of tea, which is served like you see it below, with sugar, lemons, and a bowl of sour cherries. 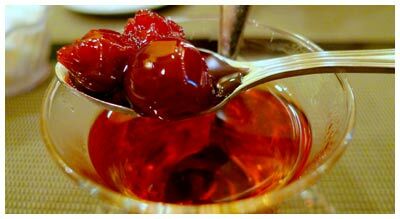 These cherries are good for eating alone or with the pancakes, but also are traditionally dropped into the tea themselves. The syrup of them sweeten the tea enough so you don't need the sugar cubes, which are not supposed to go into the tea, but rather held between the teeth as you drink so that the tea passes through it. The whole ensemble and process of this tea time was very rewarding and felt good. We ended up prolonging our stay by at least 30 minutes because of it. As we poured second and third glasses, we were told stories of the golden gate of Kiev and the horse chestnut, the city's official flower. Scene from a Ukrainian tea time.